Purpose: Sjögren's syndrome is a systemic autoimmune disease affecting approximately 3 million Americans, primarily perimenopausal women. The syndrome is characterized by dysfunction and destruction of exocrine glands leading to oral and ocular manifestations, xerostomia and keratitis sicca. Sjögren's syndrome commonly remains either undiagnosed or is diagnosed years after the onset of symptoms. Diagnosis is based on the concurrent presence of various signs and symptoms of the disease as established by 6 diagnostic standards set by the American European Consensus Group standards: oral symptoms, ocular symptoms, evidence of oral signs, evidence of ocular dryness, evidence of salivary gland involvement with positive Anti-Ro/La autoantibodies and a positive gland biopsy. Currently no definitive test or cure exists; treatment is predominately palliative and supportive. Conclusion: With an aging population and heavier reliance on medications and treatments which cause xerostomia, oral health professionals are likely to encounter a higher incidence of xerostomia and Sjögren's syndrome more than ever before. The dental professional must recognize the signs and symptoms of xerostomia, include Sjögren's syndrome in their differential diagnosis, and communicate those findings and concerns to other health care providers, including the primary care physician, rheumatologist and ophthalmologist for evaluation in a timely fashion. This article discusses the dental professional's role in formulating a preventive oral health plan: meticulous oral hygiene instructions, dietary counseling, a complement of chemotherapeutic agents and more frequent recall care to avoid oral complications and improve quality of life. Dental hygienists can help patients understand the wide range of products available to substitute or stimulate salivary flow, prevent or remineralize early carious lesions and relieve candidal and bacterial infections. Ultimately this collaboration of care by the dental and medical professionals will benefit the Sjögren's syndrome patient and lead to better patient outcomes. Sjögren's syndrome is subclassified into primary Sjögren's syndrome, consisting of dryness of the mouth (xerostomia) and eyes (keratoconjunctivitis sicca), and secondary Sjögren's syndrome, which is also associated with other systemic autoimmune rheumatic diseases, such as rheumatoid arthritis, lupus or scleroderma.3 Research suggest that Sjögren's syndrome is manifested in 25 to 35% of rheumatoid arthritis patients.5,6 Both primary and secondary Sjögren's syndrome share the same cardinal signs and symptoms, xerostomia and keratitis sicca; therefore, they are treated similarly. Dental professionals are frequently the first practitioners to detect the signs of Sjögren's syndrome. Saliva is essential for the preservation of oropharyngeal health. It aids in swallowing, oral cleansing, speech, digestion and taste. Hyposalivation or chronic xerostomia can impair the patients' quality of life. Early diagnosis and treatment is vital for preventing oral complications. Intervention and treatment are of pivotal significance, including referral to other health care professionals, i.e., ophthalmologist and rheumatologist, for diagnosis and systemic intervention. Treatment is predominately palliative and supportive. With an aging population and their heavier reliance on medications and treatments, which may cause xerostomia, oral professionals are likely to encounter a higher incidence of xerostomia and Sjögren's syndrome more than ever before. An understanding of xerostomia and its management is essential to consummate patient care. Subsequent paragraphs will explore manifestations, testing, diagnostic criteria, palliative treatment and methods to monitor and maintain the health of a patient diagnosed with Sjögren's Syndrome. The objective of this literature review is to summarize Sjögren's syndrome research focusing on oral manifestations and management of dental treatment options. Another common, painful and often chronic complication of Sjögren's syndrome is oral candidiasis.2 Signs include Angular Cheilitis, atrophy or loss of fili-form papillae on the dorsal tongue or erythema of the tongue and other mucosal surfaces; diagnosis should be verified by positive potassium hydroxide slide and/or positive culture.2,5 A study investigating the prevalence and quantity of oral yeasts and their association with oral candidiasis in Sjögren's syndrome patients receiving regular dental care demonstrated an increase in oral yeast levels, primarily candida albicans, among participants in southern China with a “satisfactory” level of oral cleanliness.12 Results also suggest that oral yeasts were present in 84% of primary Sjögren's syndrome and 63% of seconday Sjögren's syndrome versus 7% for control subjects; interestingly, none of subjects presenting with oral candidiasis experienced any symptoms.12 A positive correlation between yeast colonization and removable dentures was also demonstrated. Since Sjögren's syndrome has no cure, treatment is symptomatic and supportive. Without sufficient saliva to restore the oral pH and regulate microbial populations, the mouth can rapidly colonize deleterious bacterial, viral and fungal populations. A personalized treatment plan must be developed for the patient by their health care professionals to treat the various symptoms. A preventive oral health plan should include meticulous oral hygiene instructions to improve quality of life, and avoid complications (Figure 2). 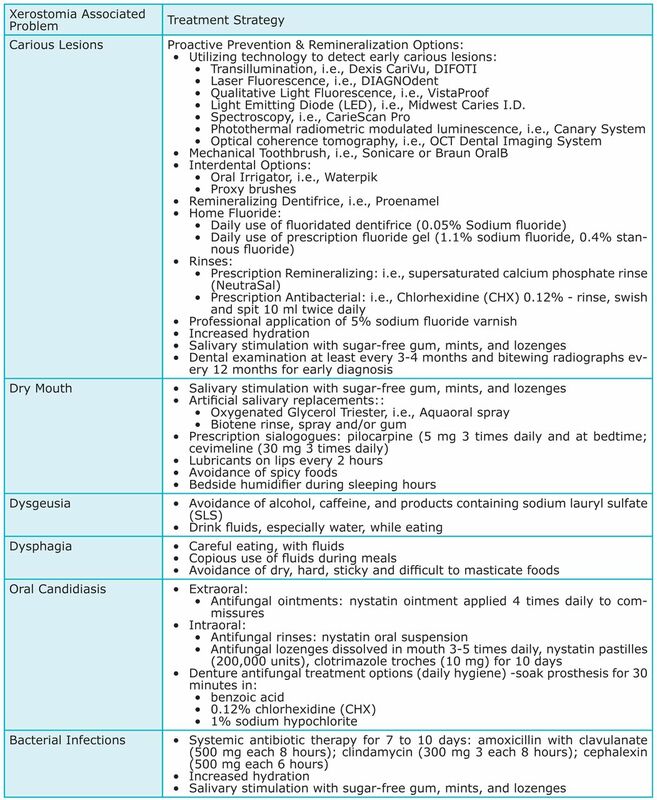 Chemotherapeutic products generally fall into 2 categories: salivary substitutes (viscous products applied to the oral mucosa in the form of sprays, gels, oils, mouthwashes, mouth rinses, pastilles or viscous liquids) and saliva stimulants (such as lozenges, chewing gum and mints, which may or may not contain medication).17 Oral health professionals should have a thorough understanding of the range of products available. Patient preference and acceptability is a significant factor when recommending chemotherapeutic products for home use. Sugar-free gum, mints and lozenges are advisable in those with residual capacity to encourage increased salivary production.17 Products containing cariostatic sugar alcohol, a bacteriostatic agent, such as xylitol or sorbitol, are recommended during waking hours to reduce the sensation of xerostomia and facilitate speech and swallowing.17 The Spry Dental Defense System hosts a line of products incorporating xylitol, including dentifrice, floss, rinse, spray and gum.21 GlaxoSmithKline incorporates a combination of glycerol and xylitol into their Biotene product line consisting of a gel, spray, rinse, dentifrice (also includes sodium fluoride) and gum.19 Manufacturer of Extra Professional Calcium Sugar Free gum, currently available in Australia, suggest that 40 mg of calcium per piece of gum is released within 20 minutes.22 Another gum with recaldent, currently available in the U.S., claims to remineralize hard tissue through the release of both calcium and phosphate in the form of casein phosphopeptide amorphous calcium phosphate.23 If Sjögren's syndrome patients can tolerate gum chewing, it should be encouraged as directed. Medication induced xerostomia, an inescapable side effect of many commonly prescribed drugs, can compound the oral manifestations of Sjögren's syndrome. Drug substitutions may help reduce the adverse side effects of medications that produce xerostomia, if similar drugs are available that have fewer xerostomic side effects.8 Taking anticholinergic medications during the daytime, opposed to bedtime, can help diminish nocturnal xerostomia when salivary output is diminished during sleep. Lastly, dividing a drug dosage over the course of a day may help avoid the side effects caused by a large single dose. Multidisciplinary management of underlying systemic conditions, such as Sjögren's syndrome, is imperative to help reduce oral complications. Management of the Sjögren's syndrome patient may include the primary care physician, rheumatologist, dental professional, ophthalmologist and gynecologist.16 When health care professionals work together as a team they can improve patient outcomes and quality of life for the patient diagnosed with Sjögren's syndrome. Deborah L. Cartee, RDH, MS, is an Assistant Professor and Junior Clinical Coordinator in the Division of Dental Hygiene at the University of Maryland, School of Dentistry. Shannon Maker, RDH, BS, and Debra Dalonges, RDH, BS, completed this project in partial fulfillment of the Bachelor of Science Degree Completion Dental Hygiene Program at the University of Maryland, School of Dentistry. Marion C. Mansk, RDH, MS, is an Associate Professor and the Director of Dental Hygiene Program, University of Maryland School of Dentistry. This study supports the NDHRA priority area, Clinical Dental Hygiene Care: Investigate how dental hygienists identify patients who are at-risk for oral/systemic disease.
. Autoimmunity and Autoimmune Diseases. Harrison's Online: Harrison's Principles of Internal Medcine. 2008. Chapter 312.
. Multiple oral candida infections in patients with sjogren's syndrome -- prevalence and clinical and drug susceptibility profiles. J Rheumatol. 2011;38(11):2428.
. Autoimmune Diseases: Acute and Complex situations. London: Springer. 2011. p 56-76.
. Oral manifestations of systemic autoimmune and inflammatory diseases: Diagnosis and clinical management. J Evid Based Dent. 2012;12(3 Suppl):265.
. Oral and salivary parameters in patients with rheumatic diseases. Acta Odontol Scand. 2005;63:284-293.
. A prospective study of sicca symptoms in patients with rheumatoid arthritis. Arthritis Rheum. 2003;49:187-192.
. Sjögren's syndrome. In: Stone JH, ed. A Clinician's Pearls and Myths in Rheumatology. London: Springer. 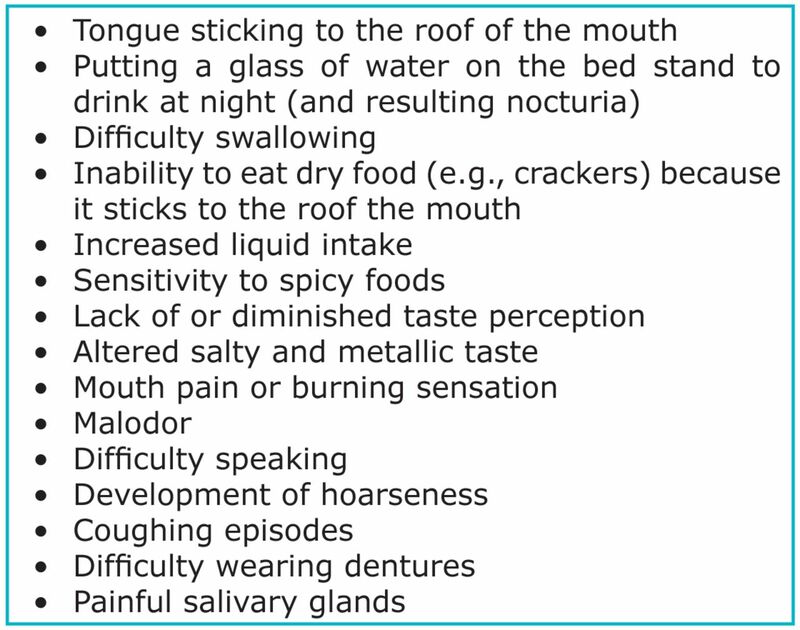 2009. p 107-130.
. Dry Mouth and its effects on the Oral Health of Elderly People. J Am Dent Assoc. 2007;138:15-20.
. Diagnosing, managing, and preventing salivary gland disorders. Oral Dis. 2002;8(2):77-89.
. Oral manifestations of sjögren's syndrome. J Dent Res. 2008;87(4):308.
. Sjögren's syndrome sufferers have increased oral yeast levels despite regular dental care. Oral Dis. 2008;14(2):163.
. Predictors for the development of non-hodgkin lymphoma in primary sjögren's syndrome. Presse Med. 2012;41(9):e511-e516.
. Central and peripheral neurological complications of primary sjögren's syndrome. Presse Med. 2012;41(9 Pt 2):e485.
. Quarterly medical review: Biologic treatments in sjögren's syndrome. Presse Med. 2012;41(9):e495.
. Topical and systemic medications for the treatment of primary sjogren's syndrome. Nat Rev Rheumatol. 2012;8(7):399.
. Interventions for the management of dry mouth: Topical therapies. Cochrane Database Syst Rev. 2011(12):CD008934.
. Stimulating the discussion on saliva substitutes: A clinical perspective. Aust Dent J. 2013;58(1):11-17.
. Diagnosis and treatment of xerostomia (dry mouth). Odontology. 2009;97(2):76.
. ARIX: A randomised trial of acupuncture v oral care sessions in patients with chronic xerostomia following treatment of head and neck cancer. Ann Oncol. 2013;24(3):776-783.